Bringing Home the Dharma includes simple meditation practices for awakening our Buddha Nature. If you want to find inner peace and wisdom, you don’t need to move to an ashram or monastery. Your life, just as it is, is the perfect place to be. Here Jack Kornfield, one of America’s most respected Buddhist teachers, shares this and other key lessons gleaned from more than forty years of committed study and practice. 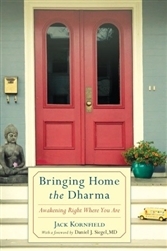 Bringing Home the Dharma includes simple meditation practices for awakening our buddha nature—our wise and understanding heart—amid the ups and downs of our ordinary daily lives.